When I give a kid a quilt, I want the quilt to be used. I’m fine if it hangs on the wall, but I hope it never winds up in the closet. I hope it gets dragged around the house. My nephew Noah gave me the best compliment I could ever receive. 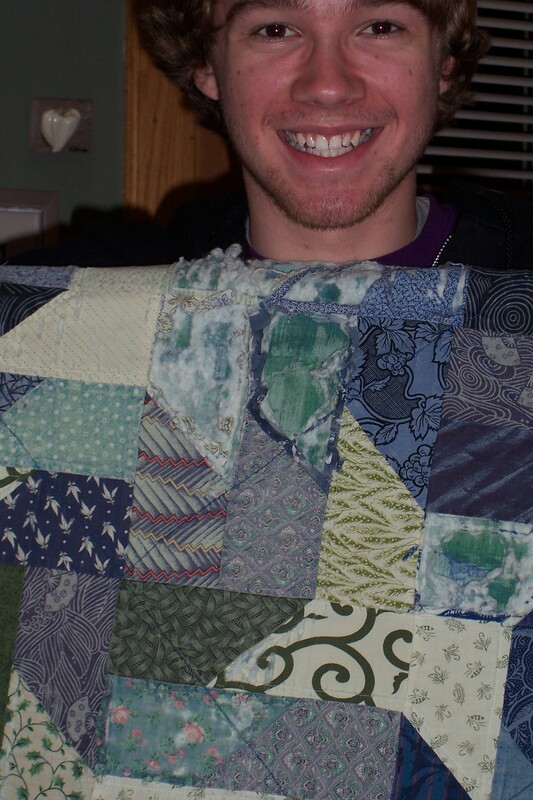 He sent me pictures of the quilt I gave him when he was an infant, almost 20 years ago. I have no doubt that he enjoyed that quilt! If you can’t see how delightfully beat up the quilt is, check out the images below. Makes me smile from ear to ear. And, don’t forget to read my blogs about the Alzheimer’s Art Quilt Initiative here. I once made a quilt for a 4 year old he loved the quilt until it was in peices ,he handed me the pieces and asked to make him another one but I couldn,t get the same fabric it was Winnie The Pooh honey bee fabric. He is now 17 years old and still remembers the quilt. A group of us made quilts for a friend’s new twins almost ten years ago. One quilt has been loved so well that the shredded remnants don’t even resemble a quilt anymore. It makes me happy every time I see it. His mom even saved one block before it was completely destroyed to frame for him later. My sentiments exactly about the quilts I make for kids. You can tell Noah loved that quilt!!! Love to see them use the quilts every day. Our youngest granddaughter used a Rag Quilt I had made for her so much – that between the use and washings it was coming apart. I told our daughter not to worry, Granny would make her another and I did. Nothing satisfies like a WELL LOVED QUILT, and that quilt has brought Noah lots of wonderful memories through the years. It’s seen a lot of mileage, and from the happy face he put through the hole in the quilt, you know he’s enjoyed every moment of its life. Thanks for sharing that with us. Ami, I think he is saying after 19 years I need a new quilt!!!! I think it’s time for a replacement! I agree with Karen. Looks to me like Noah needs a new quilt! Ami, Great photo and good it has been loved—BUT THIS MAY BE A HINT THAT IT IS TIME FOR A NEW ONE!! I think this is how the saying “I love you to pieces” got started. I also think it’s time he got another “love” quilt from you! Blessings! Every time I gift a child a quilt, I tell them (or their mom) that it comes with a guarantee. If they wear it out, I’ll make ’em another one. I want to see my quilts on the kid, on the floor, on the dog, on the couch, on the grass, in the car, at the beach, in the back seat, at a picnic, making a tent, and hugging the kid to sleep. I agree and I hope you made this kid a new quilt when he graduated high school. After loving that one so much he deserves another. PS…my 36 year old daughter still keeps the remnants of her baby quilt under her pillow…her husband understands! I loved seeing that tattered quilt – and what a handsome, smiley kid! I found out recently that our thirteen-year-old twin great niece & nephew still get out their baby quilts and put on the foot of their beds. Their mom keeps trying to pack them away and save them, and they keep pulling them off the closet shelf. I was so touched that those kids loved them that much! OMG, I have some of those prints. It’s wonderful that he, even now, still appreciates that quilt. Lol, yes well loved is a good word for this quilt. And Diana my daughter does the same…makes me laugh but that quilt s rap has been to more places around the world than me! in them. Makes it all worth while to see them smile with their special quilts!! Keep the news coming….we love it!!!! that is so wonderful that he has loved his quilt so much. puts me in mind of my children and their qults. I think he’s trying to tell you some thing…….like he needs a new quilt! I’m with you – I like my baby quilts to be used, not put away. The quilt in my dog’s bed is in better condition…..! Hi, I tell the kids and adults that I give quilts to that I will repair/replace them when they wear out. I will NOT give them any more if they are stored and only the shelves/drawers are kept warm by the quilts. And, I do agree with the others that Noah deserves a new one, maybe one in his college colors, or if in the military service, a red, white and blue with some of your favorite stars in it. There’s no greater compliment than a kid showing you a tattered quilt and politely declining a ‘replacement’ with a sweet smile that says there’s nothing in the world that could replace the love in the first one! That is fantastic!! Noah clearly loves his Aunt and his quilt and good for him. Kids in our family get quilts from me, and I expect them to be loved. I am so sad when they get put in the cupboard, they don’t need to go on a bed. In the car, on the floor, on a comfy chair is great, but use them. I will not make another one if the one they have is not being used. I think he is hinting for a new one! !